As a stationery-a-holic, this is a very exciting post for me to share with you all. There are a lot of beautiful and affordable wedding stationery options available to you for your special day, so I’m going to break it down. Before we delve into design, here is some important information about printing methods you should take into consideration when picking out your designs. Ok, don’t poo poo this. It is actually an important detail and has significant cost implications. And it might actually matter to you more than you think, so take some time to understand the differences. Here are the most popular and common printing techniques, organized from least to most expensive. For more detailed information check out Tiny Prints. ($$) Thermography – Creates a raised or 3-D effect and is a less expensive way to get the look of engraving. A great way to save some money but still maintain a formal look. ($$$) Letterpress – So hot right now. Letterpress is also like it sounds. The letters are pressed into the paper giving a debossed look. Letterpress is a very old technique and is incredibly labor intensive, so it’s going to cost ya for that yummy texture and unique look. ($$$$) Engraving – The most coveted and formal form of wedding invitation printing. Sigh. Engraving is the most formal and expensive printing technique, and the most timeless in my opinion. If you have the budget, go for it! It creates a beautiful raised look that is one of a kind and luxurious. 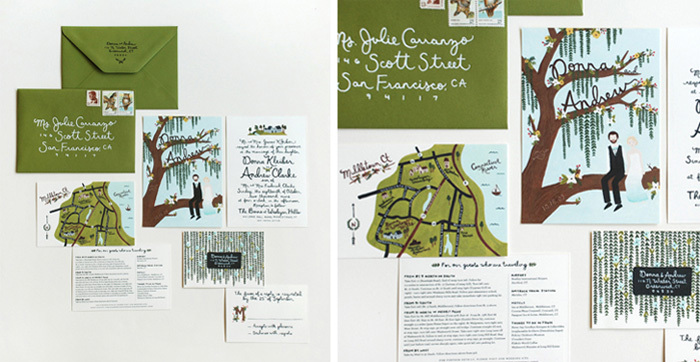 What goes into a wedding invitation? Save the Date – if you are ahead of the game and want to choose one that matches your invites. Not necessary though. Now you should have a pretty good idea of what pieces you will need for your invitation suite. Here is the fun part – looking at different designs and ideas and picking out your perfect invitation! And by perfect, I mean perfect for your event. Believe me, you may fall in love with a design, but you will see 10 more designs after you picked yours that you love just as much. So don’t get too nuts over it! Here are some of my favorite designers and brands to help inspire you with your search. All have different pricing structures based on customization and printing techniques so first just focus on what look and feel you are thinking. Try to think about what makes sense for your venue. If you are getting married in a barn, don’t pick a formal black tie wedding invite, etc. Most of these vendors don’t have pricing listed on their sites, but you can email them for specific estimates. Wedding invitation suites can cost anywhere from $500 to $8,000 depending on the level of customization, number of pieces, type of printing, and specialty papers/envelope liners used. A Printable Press – AP and I used them for our invitations. You can pick one of their designs, they will customize all your pieces for you, and you can either print the invitations yourself or choose one of the many printing options. VERY affordable, and they are great to work with! Stay tuned for the next installment of Wedding Invitations tomorrow!